Discover the City of Miami, also known as the “Magic City,” on this 6-hour city tour and sightseeing cruise. This guided tour covers the most popular places in the City and Biscayne Bay, such as South Beach, Downtown Miami, Little Havana, Coral Gables, and much more. This small-group tour (limited to 14 passengers) includes live commentary on board, professional guide, hotel pickup and drop-off. 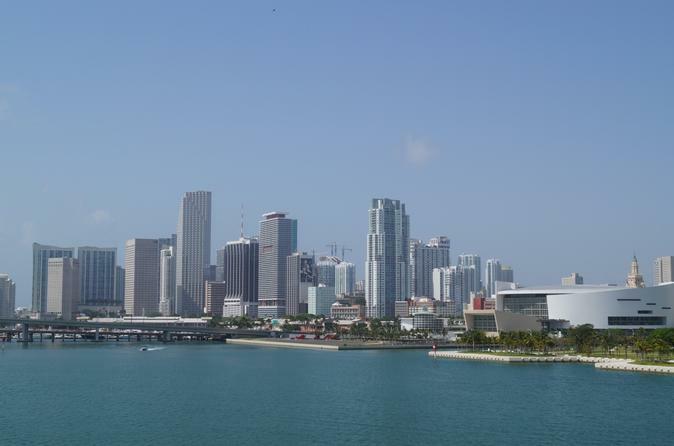 Discover Miami, which is also known as the Magic City for its history and cultural diversity. Enjoy convenient pickup at your hotel and transfer to Bayside Market Place, where the fun starts. You will begin the city tour on a passenger bus that will take you across the city of Miami. This guided tour offers you the best chance to discover Miami's most popular and scenic spots. Get to know from the comfort of your seat iconic places like South Beach which is characterized for its art deco buildings and unique life style. In addition, you will appreciate Little Havana, Cuban exiles gathered starting in the 1960's. You will witness the vibrant Cuban atmosphere at the Domino Plaza located in the famous Calle Ocho, where you can taste a typical Cuban Coffee. Downtown Miami, and its financial, cultural and commercial center, Brickell; Coconut Grove, Coral Gables and much more. The City tour will end at Bayside Market Place where your guide will take you to board the boat and enjoy a cruise along beautiful Biscayne Bay. This is a 1 hour and 20 minutes Miami sightseeing boat tour, which is considered Miami's most popular tourist attraction. On board this narrated sightseeing boat tour you will have a view of Miami´s downtown skyline, The Port of Miami, Fisher Island, the Miami´s spectacular waterways, and you will also get to see the millions dollars mansions of famous celebrities. After this half day tour ends, the driver will return you back to your hotel.